Lady and the Blog → Personal Blog → Daily Diary: Am I Really Doing This? Daily Diary: Am I Really Doing This? On Friday, I will be 36 weeks. I am beyond thrilled – excited – ready! I’m sure you all are too. My endless stories about this pregnancy must have been monotonous and I apologize about that. But we are almost there folks! I mean – literally almost there. Today I’m going to pack my hospital bag. I had Natalie at 37 weeks and I need the hospital bag checked off my list. We are also washing all the sheets, clothes, bibs etc. right now. Want everything in order – one less thing to worry about. 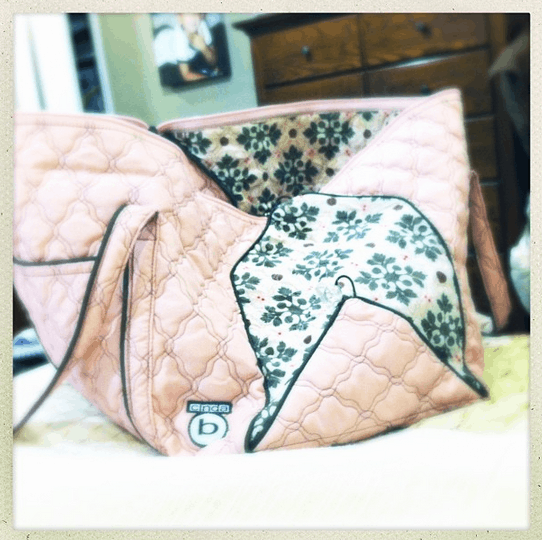 This cinda b bag has been my hospital bag for all of my babies. It’s just the right size. I also use it when my kids do sleepovers at their grandparents’ houses. So, I’m expecting a VBAC but have a feeling that I’m going to have a c-section. Either way, I’m going to pack for 4 days. Still in complete shock. Like… for real. In shock. Baby coming. What? Now? Really? I made it? What a blessing. Best of luck with it all! I love that bag by the way. Thanks for introducing me to the brand. Will be looking into Cinda B. I like that it is Vera Bradley-esque but slightly less busy. Vera, the stories about your pregnancy haven’t been monotonous at all! I’m so glad you made it and can’t wait to hear all about Mr. C. I’ve been reading your blog and I’m Not Obsessed since Natalie was small and I love hearing about your growing famiy! your stories were the best! I feel like we have been with you all the way.. this baby has an audience waiting for him. Glad that everything worked out and soon you are going to have your little boy in your arms 🙂 keep us posted as always! What do you pack?! I am at a loss of what to pack. Last time my daughter came at 32wks & I never packed. I want to pack early so I am not relying on hubby to bring my stuff. Thanks!